Can you believe that CRMUG Summit 2018 is happening in just two weeks? We’re very excited here at Ledgeview, preparing our materials and packing our bags! While at the summit, you will have the opportunity to attend many exciting educational sessions, and six will be from us. Before you travel to the summit, you can schedule your sessions ahead of time using the CRMUG Summit App or by selecting your sessions online. 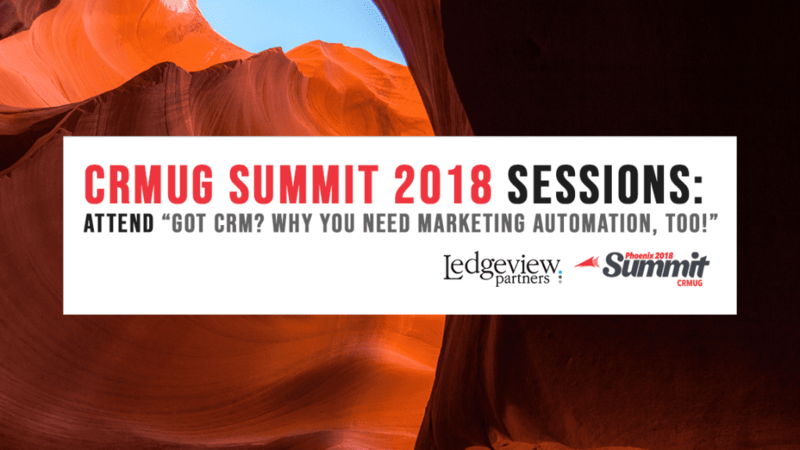 In this Ledgeview Partners CRMUG Summit session, “Got CRM? Why You Need Marketing Automation, Too!”, Chad Collett, Director of Marketing at Ledgeview, will be covering important topics around why the two make the ideal technology pairing. Though CRM and marketing automation systems are very different tools, many first-time users mistake them to be the same. Marketing automation is essential when it comes to complementing and boosting your CRM system. Learn about how marketing automation completes your CRM picture in this can’t-miss educational session under the Marketing Track. Join us at Location 223 on Tues. Oct. 16 at the summit at 1:15 p.m. for this.